Hana Financial Group announced that it signed a business cooperation agreement with Franklin Templeton Investments, a global asset management firm, with the goal of establishing a strategic cooperative relationship in Central America. 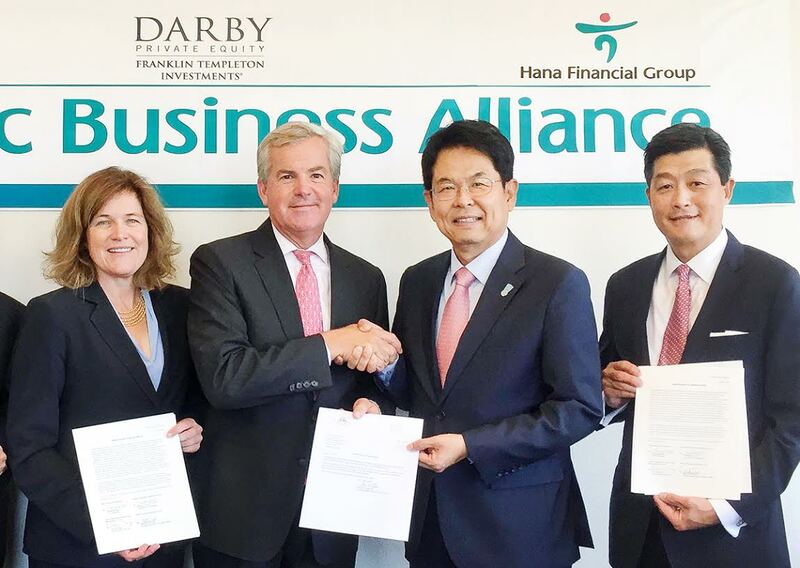 The signing ceremony was held at the head office of the company in San Mateo, California, with Kim Byoung-ho, vice chairman of Hana Financial Group, and Gregory E. Johnson, chairman of Franklin Templeton Investments, in attendance. Hana Financial Group plans to promote business cooperation with subsidiaries of Franklin Templeton Investments, including Darby Overseas Investments, in areas such as the extension of loans in Central America; exploration of investment opportunities in banks and finance companies in Central America; cooperation in real estate investment in Europe and the United States; search for opportunities to establish joint ventures in emerging markets; and participation in investment funds in Central America. Franklin Templeton Investments is an asset management firm with a presence in 35 countries and assets of 843 trillion won, as of the end of June. Darby Overseas Investments, the dedicated private equity arm of Franklin Templeton, possesses considerable expertise and experience in investment in infrastructure funds, private equity investment funds, and mezzanine funds. Hana Financial Group has a global network of 142 business locations in 24 countries, and, as a long-term goal, aims to earn 40 percent of its total profits from its overseas business activities by 2025. Based on the strength of its advanced expertise in diverse sectors, such as banking, securities, credit cards, leasing, and insurance, the group is now consolidating its position as the nation’s top global financial group. In 2006, Hana Financial Group established Darby Hana Infrastructure Fund Management Co., Ltd. as a joint venture with Franklin Templeton Investments. Since then, the company has successfully established and operated funds for investment in domestic and international infrastructure projects in various areas, including renewable energy, environment, power generation, and real estate. Hana Financial Group announced that it achieved a net income of 790 billion won, on a consolidated basis, in the first half of the year, earning 352.1 billion won in the second quarter. This represents a 5.5 percent increase, or 41.2 billion won YoY, representing the Group’s best semi-annual performance since the first half of 2012. This success was the result of stabilized business performance based on the recent synergy effect and business growth following the successful IT integration of the new integrated bank, excluding one-off gains. As a result, the capital adequacy and asset quality of the Group improved significantly during the first half of the year. At the end of the second quarter, the BIS ratio estimate rose 1.11 percentage points QoQ to 14.54 percent, and the CET1 ratio estimate was up 1.06 percentage points to 11.44 percent QoQ, representing the largest quarterly improvement since integration. This excellent performance is attributable to the Group’s steady efforts to increase profits and stringent management of risk-weighted assets. For the first six months of the year, owing to the cost reductions achieved through the recent synergy effect following bank integration, selling, general, and administrative expenses (SG&A) decreased by 4.5 percent, or 90.3 billion won YoY, and commission income rose by 8.9 percent, or 36.7 billion won QoQ. In addition, core profits for the second quarter, which is the sum of interest income and commission income, increased to 1.5954 trillion won, up 13.5 billion won QoQ.